In the multi-disciplinary exhibition, “Isolation / Insulation,” award winning regional artists Susan Kachor Conlon, Scott Poluyko and Katie Lemieux tackle the contemporary theme of self-isolation in current society. The artists view escaping stressors through distractions, withdrawing and barrier building, as psychological and emotional methods of self-preservation. Although protecting ourselves is a healthy coping skill, when the behaviour becomes redundant and stagnant, and ultimately prevents us from evolving; it is a hindranceto the human potential. Our culture indulges in a plethora of distractions. We submerge ourselves in vices to avoid and numb our emotions. Feeling uncomfortable IS uncomfortable and insulating behaviors save us from it. Disengaging and distancing have become popular coping strategies, rather than participating in real human interactions. Through their art in this group exhibition, the artists ask us: Has alienation of ourselves become a modern self-infliction? Is this great disconnect a zeitgeist of our times? This DefSup exhibition series recognizes artistic excellence in our regional artists and their continuing research and investigation of new visual contemporary artworks. 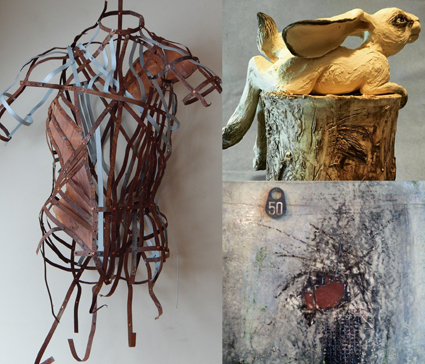 Join us for the Gala Opening Reception, Fri. Feb. 5th @7-10PM. Featuring a ferocity of art with 3 new exhibitions, live music, catered & cool refreshments, artist talks & more! Gallery 2. Shows run until March 5th.